We had our friends visiting us along with their parents who had come to visit them from India. I wanted to make something to make them feel at home. I am not very good at making traditional Indian sweets which quite tricky for me and I am not that patient. This was suggested by my mom and reluctantly I tried her recipe. To my surprise it turned out quite well and I did eat two of these lovelies [and out went my healthy eating plan....]. My guests were satisfied and surprised as well...... Job well done!!!!! Milk: 1/2 to 1 cup. 1.Place a kadai on medium flame and roast the rava. Do not brown them. 2.Grind the rava [just one whizz in the mixer grinder] to fine grains. 3.Powder the sugar [whizz in the mixer grinder]. 4.Fry the cashews and raisins in 1 tbsp of ghee and keep it seperately. Crush the cardamom pods. 5.Mix rava, sugar, raisins, cashews and cardamom thoroughly. Warm the remaining ghee and add to the rava mix. 6.At this stage add milk little by little. Try making a laddoo after each addition. If u can, then stop adding the milk. 7.Make them into equal sized balls. 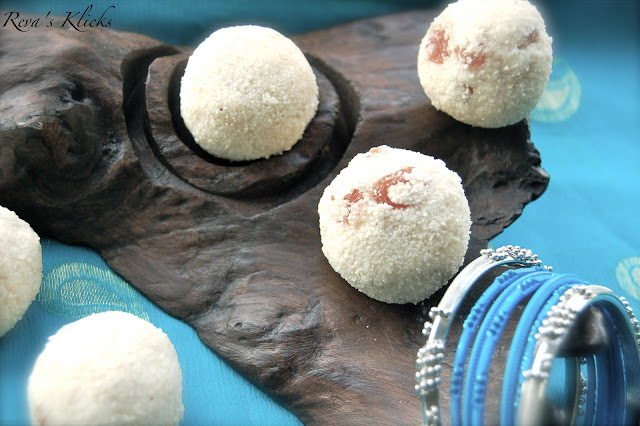 Once you have made all the laddoos, again shape them into firmer balls. Note:After adding the ghee and milk make the laddoos while the mix is warm. Don't let it become cold as it will be difficult to make laddoos. I used coarse rava for this recipe. Since milk is added, these laddoos keep well for a day or two [at room temperature].They can be kept upto 3 days if refrigerated [but the laddoos will become harder]. Use water instead of milk if you want to keep them longer at room temperature. I would be surprised if anything is left on the second day as these are yummy. That was one of the more than perfect laddoo I have seen of late, wonderful. My husband's favorite sweet reva. 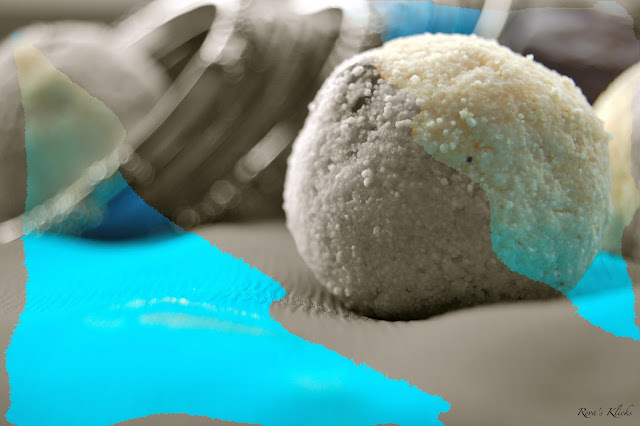 Rava ladoo looks so tempting feel like pik one from there..
Love rawa laddoo,craving for some now..
Hi. The laddoos do look perfectly made dear, a good attempt indeed. my mom's fav ladoo.. Perfect shape and good presntation..
Am an addict to this cuties, looks prefect. Looks so delicious and love the wonderful and ethnic presentation!! 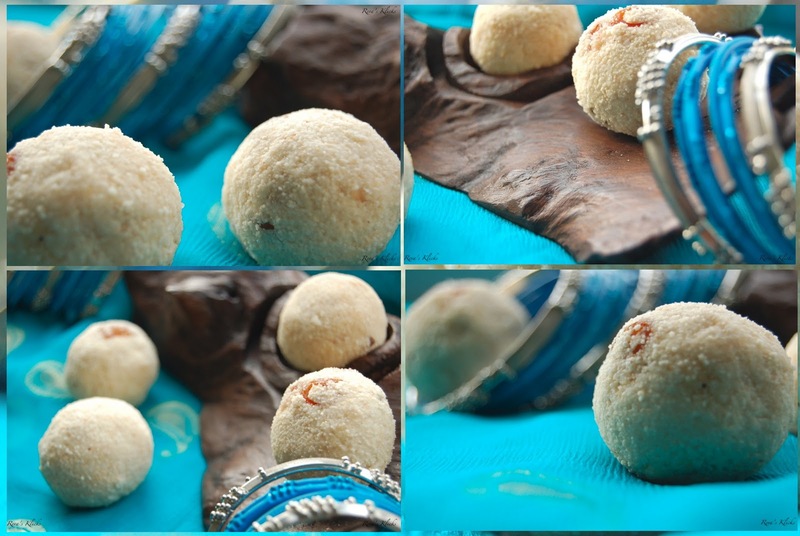 want to grab all of them:)..
Reva, super yummy ladoo.. Like the bangle presentation too..
looks delicious and super clicks. looks perfect and as always ur clicks are too good ! Your photographs are excellent, have you considered a career in food photography? or are you already a food photographer? Thanks for dropping in at my place Reva,and for your valuable scribble.It means a lot ! Thanks again for providing an opportunity to know your place.Its amazing..
Great that I could start here with sweet Laddoo..
Hi Thanku for your love;y comments..
You too have a nice blog ..Rava ladoo is super. nice clicks and ladoo looks awesome. Reva, Fantastic attempt. It is obviously a dish that requires practice & patience. The photos have captured the grainy look so well. Keep up the good work.